IDC this week said that while the PC industry would end the year better off than it had expected, the foreseeable future holds no hope for a return of growth. Instead, the business will be a zero-sum game of replacement PCs, where gains by one computer manufacturer or operating system developer will come at the cost of declines for rivals. 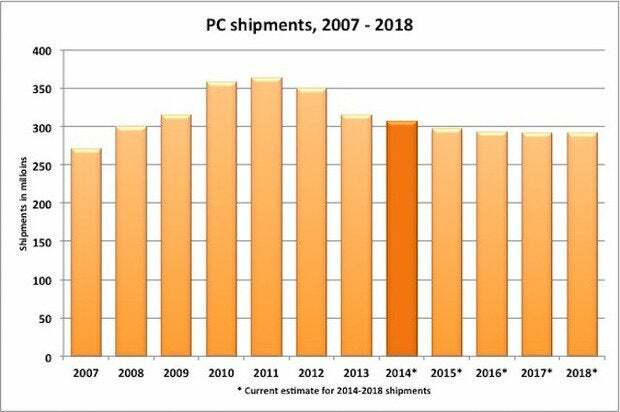 According to IDC's latest forecast, PC shipments will be down about 3% in 2014, a slightly smaller drop than the previous estimate and just half the decrease the researcher tapped earlier in the year. Ironically, the year's latest estimate was close to the 4% drop the researcher predicted near the end of 2013, before it revised its prognostications downward. Like most analysts, IDC's were caught off guard by an uptick in shipments as corporations that failed to make an April deadline set by Microsoft continued to replace Windows XP PCs months after the OS's retirement. Shipments in 2014 should reach approximately 307 million, down from 2013's 315 million, IDC said. Next year, shipments will contract by another 3%, falling to 297 million. Over the following three years, shipments will slip a bit more, ending at 292 million in 2018, the furthest out IDC dared make a guess. IDC laid the blame for the continued decline in PC shipments on the usual suspects -- consumers who, if no longer spending big on tablets, have shifted dollars to smartphones, especially those with larger displays -- and weakness in emerging markets. In 2014, shipments will be down 10% in emerging markets, said IDC, claiming that those nations account for 53% of all shipments. What the research firm called "mature markets" -- regions like North America and Western Europe -- will save the business from even larger declines; there, shipments will be up 7% -- mostly because of increased purchases by corporations. But IDC saw no reason to be optimistic about the PC's future. While lower prices, new designs and the upcoming Windows 10 may contribute to overall sales, it had no confidence that the business will do more than stabilize at around 290 million, a volume 20% below the heyday of 2011, when makers shipped 364 million systems. "In the best case for PCs, we'd see a significant wave of replacements as users who spent on phones and tablets in recent years decide they really need to update their PC," said Loren Loverde, an IDC analyst, in a statement. "However..., replacements are stabilizing PC shipments, but not boosting total volume." That means operating system providers with the smallest current shares, Apple and Google with their OS X and Chrome OS, will have the biggest upside while Microsoft (with Windows), due to an overwhelming dominance now, can realistically only hope to hold onto what it already has. Apple, for example, is on pace for a record year of Mac sales: If the December quarter sports a sequential increase in line with historical trends, Apple will sell 19.9 million Macs in 2014, nearly 3 million more than a year ago. Although the almost-20 million Macs sold would account for just 6.4% of all personal computers, that would be a one-percentage point increase over its 2013 share and a 1.5-point increase over 2012's. In a climate where shipments are declining or best case, flat in the future, any gains by the Mac come at the expense of others, particularly Windows OEMs (original equipment manufacturers). Chromebooks, powered by Google's free Chrome OS, have also made inroads into Windows PC sales this year. In response, Microsoft has tried to blunt Chromebooks -- successfully, said Stephen Baker of the NPD Group -- by subsidizing Windows for OEMs selling ultra-inexpensive laptops at the same price points. The move by Microsoft and its partners to compete with Chromebooks has lowered prices, good for buyers but not for OEMs who face even thinner margins as they try to maintain sales share in the no-growth industry. For its part, Microsoft hopes to generate revenue through services to make up for what it forgoes by making Windows free. Although the PC will not disappear -- sales stagnation will still result in hundreds of millions of systems continuing to come off factory lines each year -- an extended period of zero growth seems certain at this point. 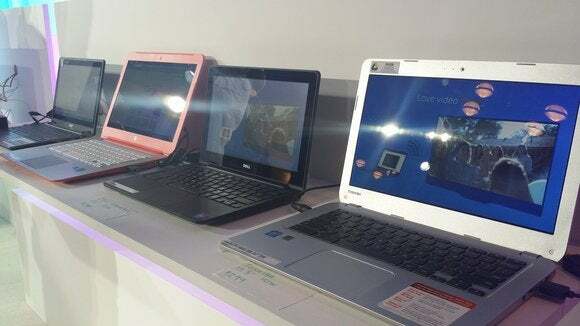 "Going forward, as younger generations become more mobile and Web oriented, and emerging regions in particular prioritize converged devices (or economy in number of devices to purchase), the PC market will continue to face tough competition and be more focused on replacements, with limited potential for growth," said IDC's Loverde. PC shipments for 2014 will be 3% lower than the year before, with an extended stretch of flat sales after that.